UNB professor and former provost and vice-president (research), Greg Kealey, has won one of four prestigious Canada prize awards from the Federation for Humanities and Social Sciences, which recognize the best Canadian scholarly books in the humanities and social sciences. Dr. Kealey won the Canada Prize in the Social Sciences for his book Secret Service: Political Policing in Canada from the Fenians to Fortress America, which was co-authored with Reg Whitaker and Andy Parnaby and published by University of Toronto Press. During his 11-year tenure at UNB, Dr. Kealey proved he has what it takes to be a leader. Under his leadership, the university’s research capacity saw significant growth with a threefold increase in external funding to almost $60 million annually. His ability to foster collaboration across disciplines, build consensus and capitalize on opportunities has created a productive and stable culture for scholars and researchers on both campuses. 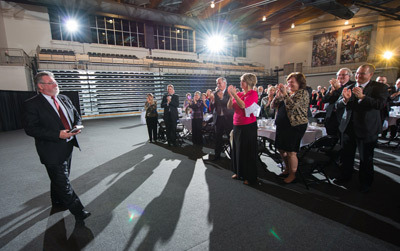 In 2008, Dr. Kealey became UNB’s first provost with responsibility for overall academic leadership of the university, playing a key role in implementing change and innovation, as well as the development of the Strategic Plan in 2010-11. Despite his dedication to his academic administrative roles, he managed to also sustain a distinguished career as a scholar of history, a respected teacher and a prolific writer and editor - for which he is now being recognized. Celebrating the best Canadian scholarly books – not simply within a single academic discipline, but across all the disciplines of the humanities and social sciences – the Canada Prizes are awarded to books that make an exceptional contribution to scholarship, are engagingly written, and enrich the social, cultural and intellectual life of Canada. Other winners include: François-Marc Gagnon, Réal Ouellet, and Nancy Senior, for The Codex Canadensis and the Writings of Louis Nicolas; Michel Nareau, for Double jeu - Baseball et littératures américaines; Nicolas Vonarx, for Le Vodou haïtien : Entre médecine, magie et religion.